It was a very sad day for Patagonia. Douglas Tompkins, an American conservationist, outdoors man, philanthropist, filmmaker, agriculturalist, and businessman; died Tuesday, December 8th, 2015 from severe hypothermia in a kayaking accident, Chilean authorities said. The Aysen health service said the 72-year-old Douglas Tompkins, who was a co-founder of The North Face and Esprit clothing companies, was boating with five other foreigners when their kayaks capsized in a lake in the Patagonia region of southern Chile. On December 8, he and five companions were paddling on Chile’s General Carrera Lake when high winds and large waves caused their kayaks to flip. Several of his companions made it to shore, but Doug and his old friend and paddling partner, Rick Ridgeway, tried repeatedly to right the kayak, without success. When they realized the wind was blowing them towards the center of the lake, they made the difficult decision to swim for shore. Ridgeway was rescued by other members of the party in a two-person kayak, and they towed him to shore. Meanwhile, a second kayaker paddling a single person-boat against winds estimated to be 50 mph reached Doug and had him hold on to the kayak as he labored to get to the shoreline. Doug lost consciousness. By the time he was pulled from the icy waters he was suffering from acute hypothermia. Doctors at the hospital in Coyhaique Chile were unable to revive him. Tompkins died in the intensive care unit of the hospital in Coyhaique, a town 1,056 miles south of the chilean capital of Santiago. Chile’s army said strong waves on General Carrerra Lake caused the group’s kayaks to capsize. A military patrol boat rescued three of the boaters and a helicopter lifted out the other three, it said. Sign-up to get the latest stories on the most amazing destinations and travel experiences from Quasar Expeditions. After retiring in 1989, Douglas Tompkins was active in conservation and environmentalism. He owned hundreds of thousands of acres in Patagonia, a sparsely populated region of untamed rivers and other natural beauty that straddles southern Chile and Argentina. On his Chilean land, he created Pumalin Park, 716,606 acres of forest, lakes and fjords stretching from the Andes to the Pacific. In 1991 he bought the Reñihué farm, a semi-abandoned farm at the end of the Reñihué Fjord, planning to set aside 42,000 acres of this unique forest from possible exploitation. In the next decade, The Conservation Land Trust added another 700,000 acres in nearly contiguous parcels to create Pumalín Park, which eventually stretched from the Corcovado Gulf to the Andes mountains, over an area of 800,000 acres making it the largest reserve in the world. In 2005, then-President Ricardo Lagos declared this area a Nature Sanctuary, a special designation of the Chilean state, granting it additional environmental and non-developmental protection. The Conservation Land Trust (a U.S. environmental foundation) has donated these protected lands to Fundación Pumalín (a Chilean foundation), for their administration and continual development as a type of National Park with public access under a private initiative.Through creating public-access infrastructure, including trails, campgrounds, visitor centers, and a restaurant, Tompkins sought to promote wilderness experience, in hopes of inspiring a deeper environmental ethic in the park's many thousands of visitors. Read more on ----> History of Patagonia. Douglas Tompkins was one of the founders of The North Face, an active wear company that is now owned by VF Corp. of Greensboro, North Carolina. He also founded, with his wife, the Esprit clothing company. In the 1990s Tompkins and his second wife, Kris McDivitt Tompkins bought and conserved over 2 million acres of wilderness in Chile and Argentina, more than any other private individuals in the region, thus becoming among the largest private land-owners in the world. The Tompkins' were focused on park creation, wildlife recovery, ecological agriculture, and activism, with the goal of saving biodiversity. The day after his death, in a fitting tribute to a man who was a giant in conservation, the Chilean government announced that Pumalín Park, one of Doug’s earliest acquisitions, will become a national park in March 2017. That declaration serves as the perfect epitaph for a man who dedicated himself to leaving behind park lands for future generations to enjoy. It's a new Chilean national park with the best features of Yellowstone, Yosemite and Grand Teton, and without the traffic or wait lists. It's also the brainchild of outdoor gear and apparel mogul Doug Tompkins, who gave up business for a life outdoors before dying this week in a kayaking accident. 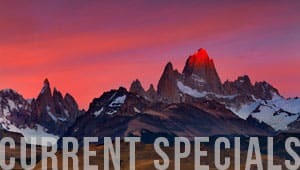 Special correspondent Mike Cerre reports from Patagonia in the video above. To learn more on Patagonia -----> Patagonia Travel. Hi, I am Fernando and travel is my passion. This passion began with my first trip to the Galapagos Islands in 1986 and later became my work when I started working at Quasar Expeditions. Now the Marketing Manager for Quasar and responsible for the creation of the Patagonia Project in Chile, my passion for travel continues to grow to new and exciting destinations in South America. SEE YOURSELF IN Patagonia ALREADY?